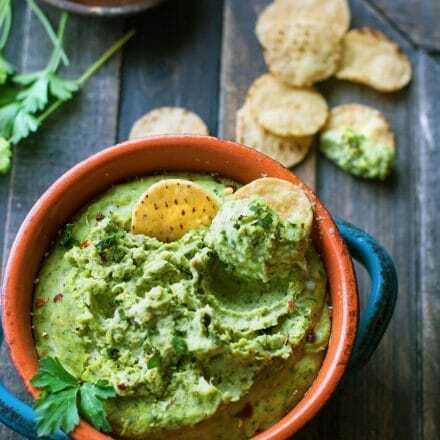 Easy Chimichurri White Bean Hummus. A healthy white bean hummus that is bursting with flavor and color! So simple to make, vegan, gluten free, and a total crowd pleaser appetizer or snack! PS It has some major health perks too. You’ll love! How to make a healthy party/appetizer food be good for you but still look edible?. Pump up that COLOR and texture then tell everyone it’s avocado! Seeing is believing, right? Haha. Just kidding. But really, that’s not the main motive with this white bean hummus recipe. Remember, it’s first week of January and we’re halfway through GREEN week, TLC week, reset week! So let’s continue with a big bowl of CHIMICHURRI White bean hummus. Yesssssss! Come on, we all need the extra greens and extra digestive support (ahem fiber). And while we’re at it, we might as well take care of that gut flora too. Hence the WHITE BEAN in this recipe. Haha, I know, you’re confused. 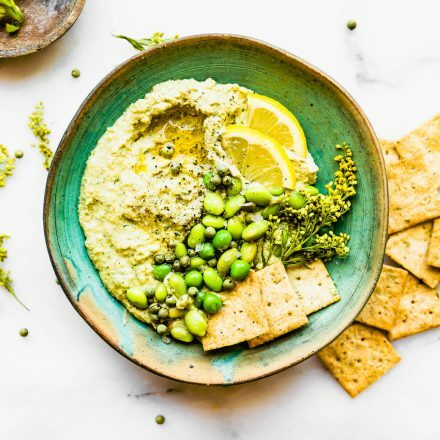 How does a white bean hummus help with digestion and gut flora? Well, for one, when white bean is it’s cooked then cooled, it becomes a resistant starch. Resistant starches feed the good bacteria in your gut. Resistant starches are a (healthy) form of carbohydrate that contain certain fiber which cannot be digested at all, this fiber will then feed the bacteria in the colon. COLD beans beans the magical fruit, the more you eat them the more your …… immune system and you digestion get one heck of a BOOST! See what I did there? Okay, now to make this bean hummus extra special and GREEN, let’s make it chimichurri style and with more parsley! The forgotten herb. 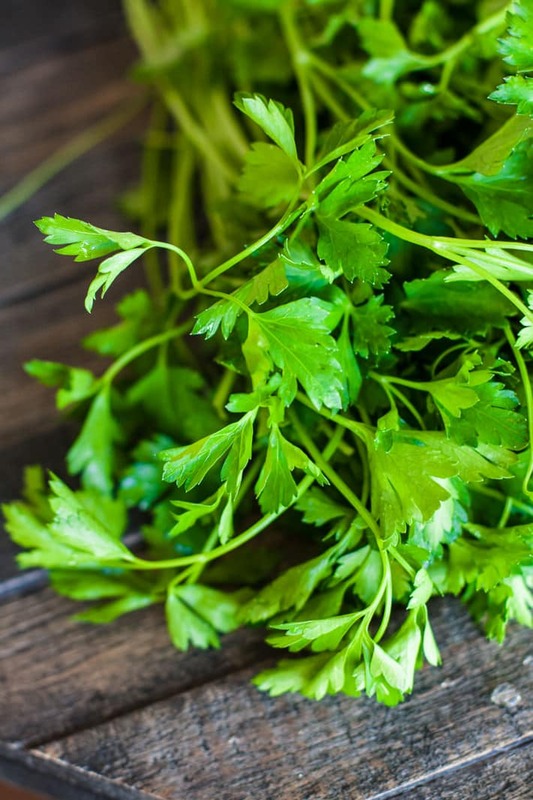 I spoke a wee bit about parsley in the green smoothie post, but Ya’ll, parsley is magical! It has a over 5oo% of the daily recommended value, which can help with bone strength. And it is an herb that has anti-inflammatory properties. 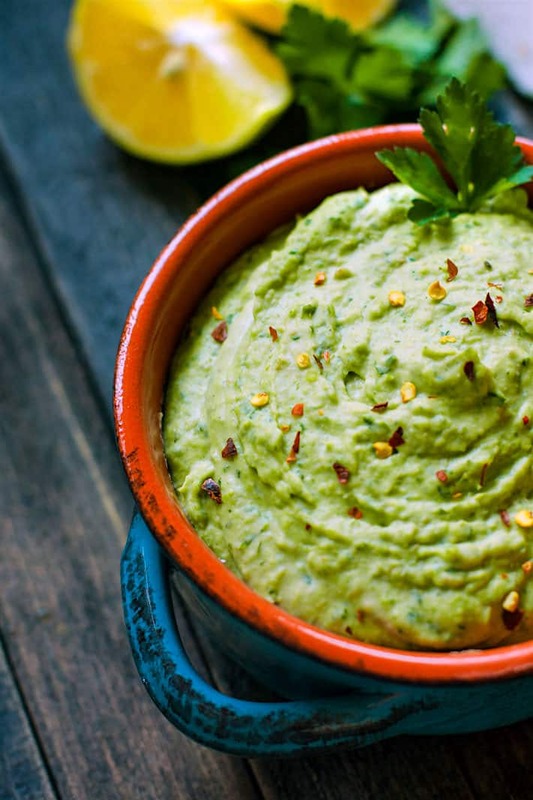 Ya, so this chimichurri hummus is like the GREEK GODS of hummus (Health Wise). But also, it’s so delicious! If I can get BEEFY MANLY TEXAS Men to chow down on a vegan dish, let alone a bean hummus dish, and not realize it’s healthy, then I’m pretty sure it’s a keeper. Right? 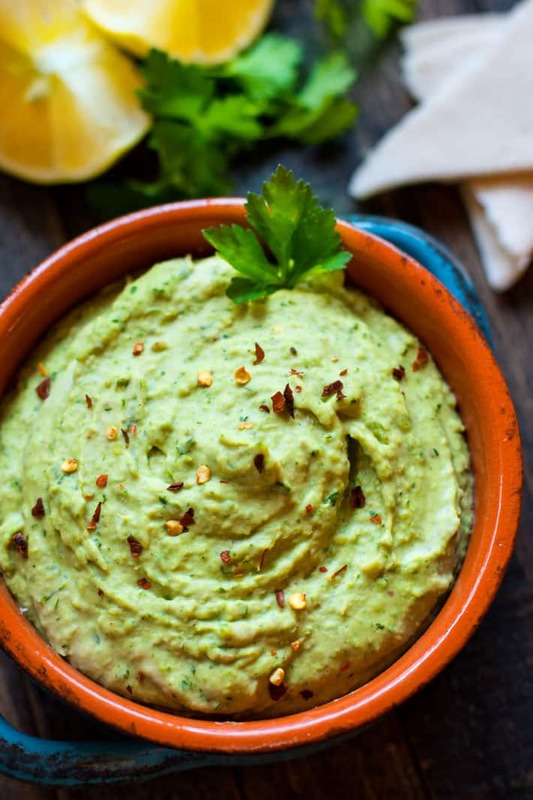 Easy Chimichurri White Bean Hummus. A healthy gluten free white bean hummus that is bursting with flavor and color! 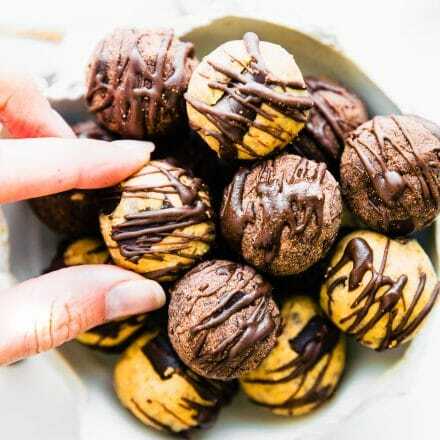 So simple to make, vegan friendly, and a total crowd pleaser appetizer or snack! First drain your beans. Next chop parsley so that the stems are removed. Place parsley, beans, tahini, and onion in a food processor or quality blender.. Blend until smooth. Slowing add in your oil and the rest of your ingredients, minus the black pepper and chili flakes. Blend again until a thick dip is formed. Spoon into a bowl and top with black pepper, chili pepper, and more parsley, cilantro, and sea salt if desired. 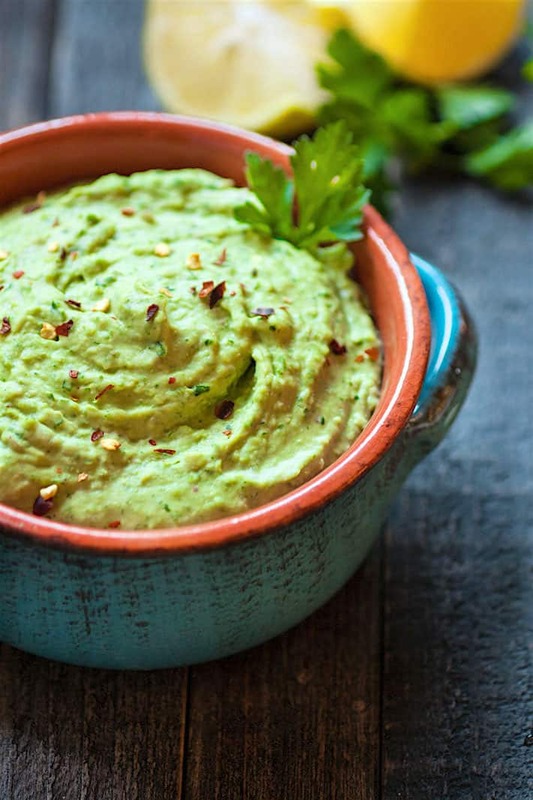 If you are using avocado oil, the hummus will have more of a green color. Regular olive oil will turn out light green. Both work great! To spice it up, feel free to blend in a jalapeno! Nutrition for a 1/4 cup serving. So here’s an idea! Serve this fun white bean hummus at your next football party, potluck, or family gathering! Or keep it all for yourself, I won’t judge you. Promise! And if you use sprouted grain tortilla chips to dip into it with, you get major BONUS health points. Just sayin…. Favorite type of hummus? Chimichurri fan? p.s If you’re curious about beans and gut health, just check out my oldie but a goodie Texas Paella. Or Dr. Allan Christian’s Huffington post article on beans. TOOT TOOT! Toot toot has me laughing 🙂 I haven’t revisited beans in a while but maybe now they would be easier since I’m feeling a lot better. This looks way too delicious and healthy! i totally get that. I think lentils and white beans are the easiest for me to handle. and chickpeas, but mostly in hummus form really. Soaking them really helps! Beans forever! One thing is for sure I need more parsley in my life but I should eat the beans too otherwise I probably won’t absorb the nutrients. Toot toot! YES!! 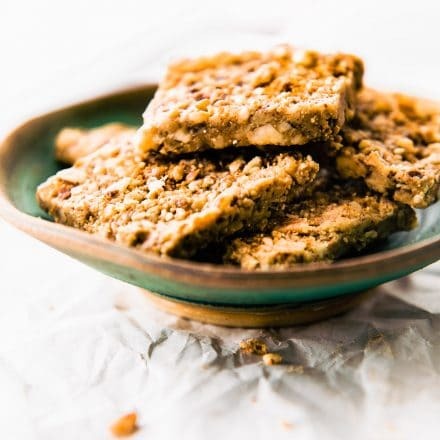 This is perfect for those of us who need snacking time in our day! 🙂 Healthier option for a healthier new year! oh tell me tell me! and i promise to keep a secret. It would be great with chickpeas. LOVE hummus. Pretty much all kinds of hummus too. I’ve never had anything chimichurri before but I definitely want to try! you should try making a spicy one! i bet it would be fab! haha yes, after. and it’s so close! 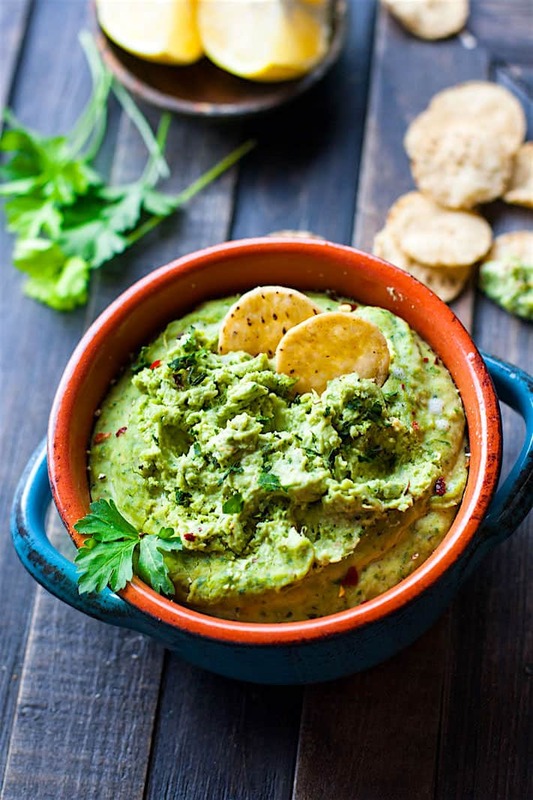 I’m a huge fan of hummus and a huge fan of chimichurri – but combining the two is just GENIUS!!! Who’d have thunk that gut health could look (and smell) so good! haha yes, good thing it smells good. we are talking beans here. LOL! I recently discovered a black bean hummus at Stop and Shop and it is so good with a nice little kick of heat to it! i bet that is tasty on toast! i agree! i love that color too! makes me happy. I have been obsessed with fresh parsley this past month. I just keep buying huge bunches, chopping and throwing it as is on everything! yes! we are so parsley and hummus twins! p.s. are you back on FB yet? No :/ One more week….Wednesday the 13th at 7:21am…counting down! I love hummus. This looks delicious, and if I remove the red chili pepper flakes, it’s nightshade-free and fits into my diet. Thank you!!! Oh hey there hummus with all my favorite flavors, come get in my belly!! I’m so all over this 🙂 Now the question is how do I enjoy this first? On a collard green wrap with my favorite veggies or with plantain chips… decisions decisions! don’t worry, I’ll eat it for you! Give me all the hummus! I could probably put it on anything or dip anything in it! Ok that may be an exaggeration but it is so good! hehe, yea! 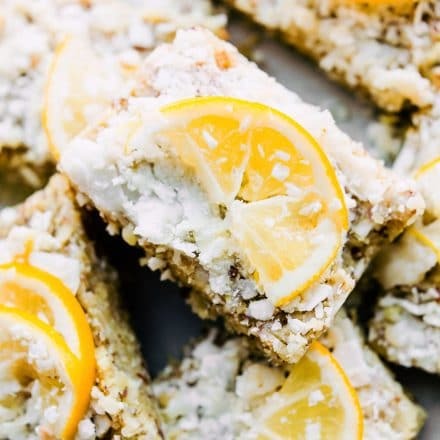 and p.s I think your next mission will to make white bean brownies… yes? are you still in states? if so, let’s grab amanda and have a PARTY with hummus ,duh. and prosecco! I love chimichurri and I always mean to make it….but it’s one of those things I just forget about. This looks DELICIOUS!! Totally drooling over here! I serve store bought hummus with carrots as a pre-dinner snack when the littles are clinging to my legs complaining of being soooooooo hungry, I’m pinning this for this week’s meal prep, looks delicious! i’ll be your kid any day then! I’ve been in a big hummus mood lately. his honestly doesn’t look overly complicated and I could possibly make it! I don’t eat a lot of beans anymore because they didn’t agree with my stomach, but I LOVE hummus so much – all the beans I’ve eaten in the past three months have been in hummus form! I should try soaking the beans – do you do that with the dried beans or with canned beans? so the white beans are pretty easy to digest (for me at least). I don’t soak the canned ones. Only the fresh. Keep me posted!! YUM! This looks amazing! My fave type of hummus is pumpkin! Have you ever tried it?? SO good! …also, I’ve never had chimichurri!! But it sure is a fun word… and looks so tasty! Great recipe! Thanks for sharing! Oh i need to try pumpkin! on my list! Thanks so much for the link to the Huffington Post article. It was a super informative read. I had to search for the 2nd part but that was also very eloquent in refuting the arguments against beans. I find if I cook beans super well and make them into some sort of hummus-y dip thing, I love them and they settle well. I’m not a fan of them whole but as long as they are whipped = delish! Thanks! glad it helped! it’s always hard to know what’s best, right? This is definitely a keeper. 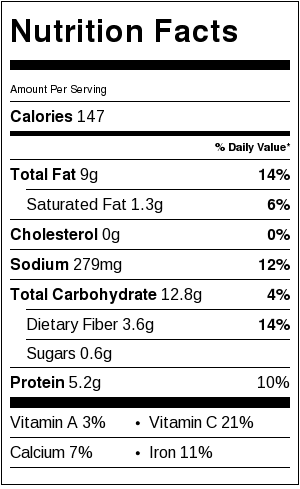 I’m down with any dip which comes with a side of fabulous nutritional stats along with a delicious taste. Good thing I have a bundle of frozen parsley in my fridge too. I knew I saved it for a reason. So good! I think I might like it better than traditional hummus. oh yay! glad you liked it. Was the recipe easy to follow? You serm to be well informed about nutrition. My husband is suddenly very allergic to guacamole. I had to search your entire entry to make sure this had no avocado. Do you know what factor in guacamole other than the avocado itself could make himso suddenly ill? I can’t eat avocados so experimentation is pretty limited. Hi sue! Yes avocados can become an allergy. They are a fruit so similar to a mango allergy, it’s all about the fructose and how it reacts to your body. Is he having skin reactions? Or other reactions? 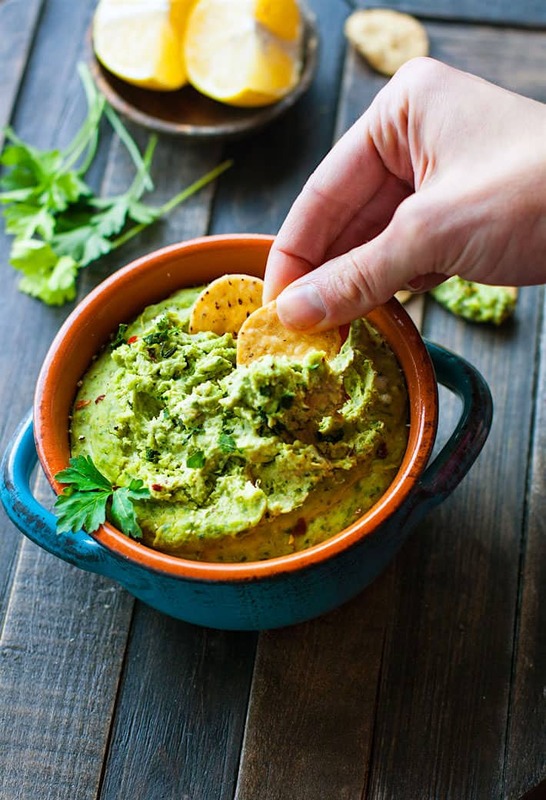 If you are using chilly in the guacamole it can cause sensitivity, which gives symptoms similar to allergies. Especially if your husband had eaten chilli or spicy spices in other products. Lindsey, fructose is a sugar and can’t be an allergen, it occurs in all fruits and honey. Allergens are specific proteins, different in each product. But actually avocado and mango are related and often allergy occurs on both. Parsley IS amazing. It made my post C-section swollen ankles normal again. Of course I was eating it by the handful with lemon juice!! But it worked. ohh good to know! Love the healing factors. This looks really interesting, but I’m from Argentina, and chimichurri is Our sauce, and it’s nothing like that. Sorry. Oh for sure! I made the sauce and put a spin on it with a bean hummus. Totally not real chimmichurri, but a tasty combo!